Sometimes back when I was trying to make a list of books by Indian authors to buy from India my blogger friend Vibha suggested this title to me. I bought this book from India and recently finished reading it. Firstly, I would like to thank Vibha for recommending me this fabulous book, I am so glad to have read it. 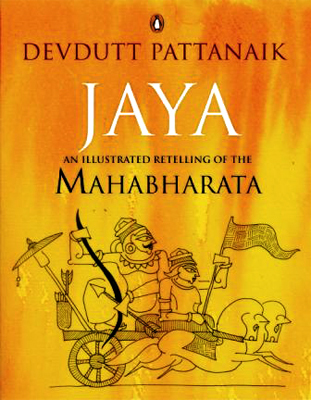 Jaya by Devdutt Pattanaik, as is evident from the cover of the book, is an illustrated retelling of the great epic Mahabharata. I have not read the original Mahabharata but I have fond memories of watching the TV serial by the same name on Doordarshan when I was a kid. The closest I have come about reading any literature relating to Mahabharata is the novel, 'The Palace of Illusions by Chitra Banerjee Divakaruni (this was also recommended by Vibha), a take on Mahabharata through the viewpoint of Draupadi. The Mahabharata is the tale of the terrible war between the Kauravas and Pandavas over the ownership of crown of Hastinapur, that changed the course of Indian history. To lure you a little more here are some one liners from the back of the book to give you an idea of the plots and complexity of this epic saga! In Jaya, the author has meticulously tried to retell the epic saga, the events that lead to the war, incidents that happened during and post the war and how it affected the people around and those involved in it. The author has not only retold the epic in simple words but has also provided the readers with insights in to the stories and the lessons we can learn from it. Overall, a very well researched book, a must read for any one is remotely fascinated by or interested in Indian Mythology. After reading this book, I can definitely say that my knowledge about Mahabharata has improved and that was evident to my Hubby too, when I could answer Mahabharata related questions asked on the show Kaun Banega Crorepati, of course, we all play KBC while watching it! My hubby looked impressed(although he would never say that) and I just smiled! I have been waiting to read Jaya since the palace of illusions.. shocking isnt it, as to how much we had been ignorant about one of the greatest epic of our country.. good review, esp the lines from the back of the book..